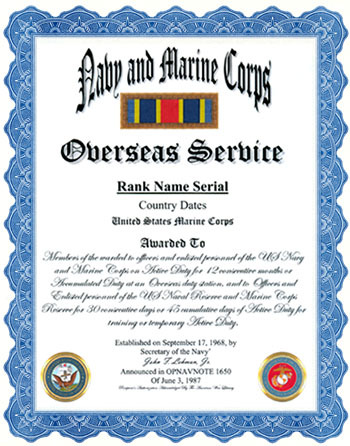 An unaltered photocopy of your DD-214, OR WD AGO 53-55, OR other military issued document clearly displaying your Navy and Marine Corps Overseas Service Ribbon. Authorized by the Secretary of the Navy on June 3, 1987, and awarded to officers and enlisted personnel of the US Navy and Marine Corps on active duty for 12 consecutive months or accumulated duty at an overseas duty station, and to officers and enlisted personnel of the US Naval Reserve and Marine Corps Reserve for 30 consecutive days or 45 cumulative days of active duty for training or temporary active duty. 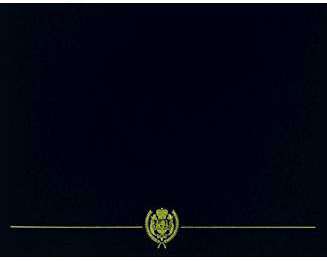 The Navy and Marine Corps Overseas Service Ribbon was made retroactive to August 15, 1974. Qualifying service performed between August 15, 1974 and January 1, 1979 may only be credited toward the initial award of the ribbon; subsequent to January 1, 1979 one award will be granted for each qualifying period. This ribbon is awarded to officers and enlisted personnel of the Navy, Naval Reserve, Marine Corps, and Marine Corps Reserve for 12 months consecutive or accumulated duty at overseas shore-based duty stations. In the case of inactive reservists, the ribbon is awarded for 30 consecutive or 45 cumulative days of active duty training or temp-orary active duty at overseas stations, including deployed units and units homeported overseas. An individual cannot receive the Sea Service Deployment Ribbon and the Overseas Service Ribbon for the same period, nor can the same period of time be used to earn eligibility for both the Naval Reserve Sea Service Ribbon and the Overseas Service Ribbon. The Navy and Marine Corps Overseas Service Ribbon is worn after the Naval Reserve Sea Service Ribbon and before the Navy Recruiting Service Ribbon. Subsequent awards are noted by bronze service stars three-sixteenths of an inch in diameter (a silver star the same size denotes a sixth award).